When I first started backpacking years ago, I quickly realized that I needed to make some serious choices in the cooking department if I wanted to maintain my over voluptuous girlish figure. As a result, I purchased a sizeable canister stove, several fuel canisters, and a nice set of hard-anodized aluminum pans which came in every shape and size (but all fit together in one another for “packability”). Thinking smartly, I then went to the lantern isle and grabbed the lantern which cast the most light and consequently worked with the fuel canisters from the stove. I officially succeeded in having the ability to cook for at least a dozen heavy campers and I could turn night into day with my lantern. This all seamed great…in the store….and I happily purchased the items and headed for home. Because I had a nearly 6,000 cu/in expedition pack by Gregory, everything I purchased fit nicely in my pack. I’m pretty sure I could have also fit a refrigerator, but I decided against it because I was “roughing it”. As you can imagine, the load broke my back and made my backpacking experience totally miserable. I didn’t need a ton of pans or several of them and I needed a smaller and lighter stove. The lantern was also overkill. Fortunately, I evolved and learned educated backpackers don’t need to suffer with the burden of a heavy cooking system and by default my backpacking experience became more pleasurable. When considering a cooking system, it is important to consider all six components (1) the stove, (2) the pot stand, (3) the cooking pot, (4) the fuel (and fuel container), (5) eating utensil, and (6) the windscreen. · White Gas Stoves – Great for winter camping because of their high output and reliability, but usually pretty heavy and I don’t know of anyone who enjoys carrying the fuel or container. · Compressed Gas Stoves – Great overall, but the containers are cumbersome, environmentally unfriendly, and they must be carried after emptying. Jetboil, Primus, and MSR seem to hold a pretty tight grip on the market although there are plenty of options. 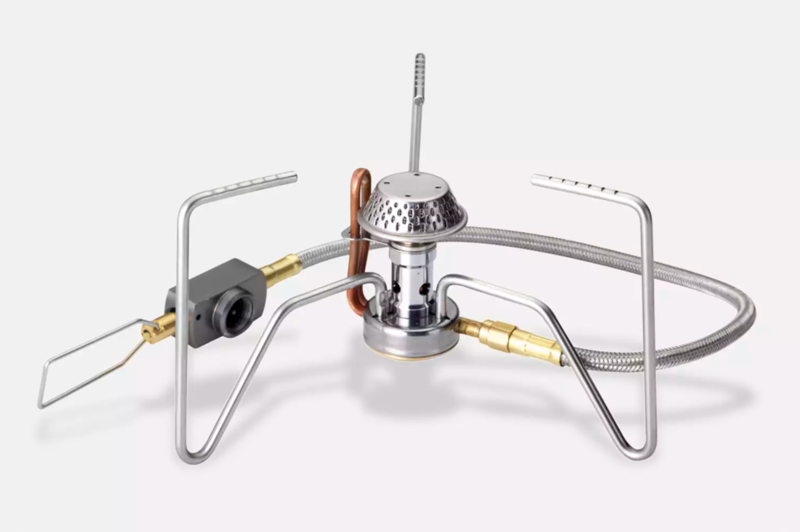 · Alcohol Stoves – Denatured alcohol is a great fuel source and these kinds of stoves are usually very light, inexpensive, reliable, free of moving parts, do well in most environments, and are fairly efficient. There are several options available with leading choices including Trangia, Vargo, and Brasslite. Each of these are great options as they provide a stove and pot stand together. Personally, however, my lightweight alcohol stove of choice is the Caldera Ti-Tri by Trail Designs (http://www.traildesigns.com/products02.html#titri) and often sold by Titanium Goat (http://www.titaniumgoat.com/TiTri.html). I have also been known to enjoy a homemade stove and pot stand which I made from a small cat food can. I can’t say I’ve ever seen a lighter option and it is the perfect size. I should mention that this idea came from Andrew Skurka and you can find directions on how to make one yourself on his website at (http://www.andrewskurka.com/advice/technique/fancyfeaststove.php). You can also make similar stoves out of empty soda or sauce cans. · Esbit Stoves – Esbit stoves are essentially those which burn a solid fuel tablet and are likely the most lightweight option for backpacking. When I was younger, I often placed these tablets on a rock and used other rocks to surround it which created a pot stand. Although this worked, it hampered the efficiency and it also scarred the rocks and thereby was irresponsible on my part. At 11 grams and with a pot stand, the Firelight Titanium Esbit Stove (http://www.backpackinglight.com/cgi-bin/backpackinglight/titanium-esbit-wing-stove.html) is the lightest Ebsit stove option I’ve found. · Natural Stoves – A natural stove, one that is fueled from things in the environment, could be as lightweight as three sticks forming a tripod with a pot tied to it over a fire. Unfortunately, fires are illegal in many hiking locations. With that said, the lightest stove I’ve found which uses natural sources for fuel is the Bushbuddy Ultra Stove (http://bushbuddy.ca/) at 5.1 ounces. Considering fuel is often the heaviest part of most stoves, and the fact that the use of natural resources means that fuel is infinite (never needing resupply), this may be the best choice for any long-term trek. Course, it depends on the environment for fuel and in very wet regions this may be difficult. There are several different options for lightweight crockery; the key is to determine your true needs. In many cases, a simple lightweight cup would likely be enough to meet the needs of most hikers as it boils water for drinking and to put in cooking bags. Essentially, often a single cup is enough for your entire backwoods kitchen. Since many people eat directly out of bags, additional plates and pots aren’t necessary. Lids also make water boiling more efficient and can be used in a pinch as a griddle for making pancakes and such. Evernew, Snow Peak, MSR, Titanium Goat, and others make great lightweight titanium gear and a simple Sierra Cup may be plenty. Coated aluminum, such as the hard-anodizing process, is also very practical and lightweight, although not as durable as titanium. Keep in mind, aluminum is lighter than titanium, so the question is whether you need something more durable (titanium) or if you'll take care of your gear and something lighter (aluminum) would be more responsible. Orikaso and Coleman both offer heavy plastic sheets which can be folded into items such as cups, plates and pots, and although they can serve double-duty as a cutting board and even something to sit on, they can’t be put on a stove and they don't offer any appreciable insulative qualities. Sea-to-Summit manufacturers rubbery collapsible dish wear too. It is worth noting that pots with a curved bottom are easier to clean and those with handles will prevent the need for a glove or other implement to handle it when hot. Pots with wider volume (as opposed to taller) also spread the heat more evenly and tend to cook more quickly, a very important point when attempting to melt snow which takes awhile. · Light My Fire (http://www.light-my-fire.com/230-147-spork.htm) is only 9 grams and has a fork, spoon, and knife all built into one lightweight utensil. · Firelite SUL Long Handled Titanium Spoon (http://www.backpackinglight.com/cgi-bin/backpackinglight/bpl_long_handled_titanium_spoon_sul.html) is 11 grams...but tough to buy as it seems to always be out of stock. · Sea to Summit Long Handled Spoon (http://www.ems.com/1/1/4967-sea-summit-titanium-long-spoon.html) is 17 grams. · My current favorite is the GSI Rehydrate Long Handled Spoon (http://www.ems.com/1/1/4967-sea-summit-titanium-long-spoon.html) which is a scant 11 grams and made of the durable material Lexan. To get peak performance out of a stove, and in many cases maintain the flame and to prevent the pot from falling over, a decent windscreen is a solid choice. A Caldera Cone by Trail Designs (http://traildesigns.com/products01.html) is a great option because it also serves as a pot stand and thereby a lighter no-frills stove can be carried. Other lighter options include a Titanium Windscreen (http://www.backpackinglight.com/cgi-bin/backpackinglight/titanium-foil-windscreen.html or http://www.titaniumgoat.com/windscreens.html) or a simple piece of heavy duty tin foil. When selecting your cooking system, weigh each piece of gear and bring only that which you need. If you think you may need more because of a survival instinct, remember that you can usually light a fire to cook from if you are genuinely in an emergency situation. With that said, ensuring you have some dry matches and good fire-starting kindling should ensure you only bring what you really need. Limits. Either know them or learn them the hard way. Knowing “when to say when” is often an exercise in mental and physical humility that can be applied to many aspects of life. Over the weekend I ate a nice slice of humble pie and got the pleasure of sleeping in a warm and comfortable bed merely to recollect about my adventure on my blog today. On January 16th-18th, the east coast of the U.S. was met with the coldest temperatures of the year. With my second son due any time within the next two weeks, this represented my last weekend for at least awhile to escape for an overnighter without the constrictions of work and family obligations taking prescient. Regrettably, it was cold and long past the point of “fun cold”, but I didn’t have a choice as my time was limited. On Saturday as I was watching the news while packing my gear, the weatherman came on with his usual semi-obnoxious rant about cold. He danced in front of his forecast and gleefully embraced winter. It was 8 degrees and I was heading for the mountains where it was no doubt considerably colder. I arrived at Shenandoah National Park in relatively quick fashion. Surprisingly, no other cars had made the trek. I stopped at the Park Ranger gate and was met by a Ranger who looked a bit surprised after seeing my backpack in my passenger seat and said, “You’re not staying the night are you”. I told him of my plan to take a quick 12 mile hike up to the summit of a trail I hadn’t walked before and my intent to stay overnight on a spot between two small hills which appeared relatively flat on my map. Glancing up at a board in his make-shift office which had weather information for different parts of the park, he quickly explained, “are you aware it is 2 degrees here and where you’re doing it will probably be around -10 with a wind chill of -20 or so”. Not fully digesting the numbers and being set on my mission, I quickly completed my backwoods permit (a requirement in the park) and began to hastily head towards he trail while dismissing the Ranger who I assumed received a call from my wife and was fully intent on talking me out of my weekend plans. Just as I started to pull away the Ranger said one more thing which I guess annoyed me more than anything. He said, “We’re expecting snow tonight and if there is even a hint of snow or ice on any part of the road within park boundaries, we close the road with gates. If you try to come out and the gates are closed, you’ll have to call a Ranger to open the gate and it might take him several hours or more to get to you depending on their other obligations and how many people we have on staff”. He gave me an (800) number and I drove off pondering the impact it would have on my schedule if I couldn’t get home on time Sunday evening and the even greater issue it would create if I couldn’t get to my job on Monday which required a nearly three hour drive north. Knowing that any snow predicted was minimal and exercising my God given male right to be pigheaded, I decided to press on. After all I figured, hitting the trail in such conditions would likely ensure I was the only one there and I’d hopefully get a chance to see and experience things which would otherwise disappear under the audience of others. I understand survival enough to know that sweating in the cold is a quick way to freeze to death. Although it was cold, I knew I would be moving and generating enough heat to keep me warm which allowed me to wear minimal clothing. Being someone who takes pride in lightweight gear, I also wanted to keep my gear as light as possible and I even used the same lightweight pack I often use in the summer to ensure I didn’t bring any unnecessary redundant gear as it simply wouldn’t fit in my low volume pack. As I exited my car I was slapped quite abruptly in the face by the wind and the obvious cold numbed my entire core quite quickly. I put on my lightweight hat and gloves and pulled my 3 oz windbreaker shell over my single thin layer of merino wool and thin layer of capilene. I was wearing my Inov-8 Gore-Tex trail runners, a pair of eVENT gaiters, and a pair of eVENT pants. I felt both the gaiters and pants were overkill since there was no snow on the ground and I wasn’t likely to encounter any, but I figured they’d serve as a great windbreaker, contain some body heat because of the material, allow me to forego the need to carry rain/snow gear for my lower body, and I’d pretty much be prepared for sitting on anything even remotely moist. With the breathability of eVENT, I assumed it was a pretty decent choice. It didn’t take long for my body to heat up and my lightweight ensemble kept me warm despite the fact that I probably looked like a Springtime jogger to anyone who might see me. I think my extremely lightweight wind jacket was likely my most functional piece of gear as without it I simply would have been unable to fight off the cold forced in by the wind. As I traveled down the Appalachian Trail looking at the frost and ice across the landscape and frozen ice shapes on anything which had the slightest moisture, I started to go through my conversation with the Ranger. At that time I realized I had incorrectly put the wrong entry point on my backcountry permit as I had deliberately added a few more miles to the trip by taking a more southerly route which would lead to the trail and would allow me some more time on the AT which I always enjoyed. For a little over three miles I walked until I incidentally came out at the parking lot which was listed on my permit as the trail picked up on the other side of the lot. Sitting in the otherwise empty parking lot was a Park Service truck with a Ranger sitting behind the wheel. As I past by him he leaned out the window and said, “are you the guy planning to summit that ridge over there (pointing to a white rock outcropping) and spend the night”. I acknowledged that my legacy indeed had apparently come full circle around the world and made it to his ears. He said, “You know it is a lot windier and colder up there than here and you’ll be very exposed. We also may need to shut the roads down.” I relived the same conversation I had with the previous Ranger, assured him that I’d be careful, and pressed on with a little more uneasiness now that I had two “professionals” clearly familiar with their own backyard doing their best to discourage me from attempting to spend the night. I walked for another 6 miles or so enjoying the stillness of the forest although getting chilled here and there as my pace slowed or when hit with a particularly unfriendly gust of wind. I arrived where I intended and found the small flat area where I planned on spending the night as I found on my map during my pre-trip planning. Unfortunately, the area wasn’t too welcoming for camping as it was covered with basketball-sized or bigger stones in all different kinds of imposingly sharp positions. Disappointed that “my spot” was clearly uninhabitable and feeling particularly chilly now that I was completely exposed and on top of the mountain, I sat down and took off my pack to relax. I reached back for my water and quickly noted that it was almost completely frozen. My other bottle seemed to have faired slightly better, but was well on its way to freezing too and it would require me to puncture ice which formed around the spout area. I then glanced at my backpack and noticed a white substance on the back panel and along the waist belt. Touching it, I quickly figured out it was ice which formed from the sweat from my back. As I pondered the fact that it really WAS quite cold, I reached down to adjust my gaiter and noticed it was damp. I looked around as if expecting to see an icicle dribbling water on me, but instead I found the inside of my gaiter, the zipper, my eVENT pant leg, and the top of my sock were starting to freeze from my leg sweat. Doing a quick check, I also noticed my hat and and the back of my jacket (now separated from my pack) had ice crystals forming. Despite trying to wear as little as possible to prevent sweat, my minimal gear was still wet and consequently freezing. Probably the most awaking moment was when I noticed ice crystals forming on my liquid medication and liquid water treatment. Knowing full well to expect some level of freezing, I had most of these items very close to me so my body warmth would keep them from freezing. This plan clearly wasn’t working and now I was on the peak of a small mountain completely exposed to the elements, my clothing was freezing, there were no reasonable places to camp, and the sun was slowly starting to set. Although my perceived machismo may have taken a hit as well as my desire to see the sunrise on a frosty morning, I made the decision to head for home. Instead of finishing the loop which would have me pushing deeper into the woods and across at least 3 bodies of water in unknown conditions, I decided to backtrack. Perhaps it was Mother Nature’s sense of humor, but the walk back seemed particularly cold and defeating. I added another layer on my top principally because I wanted to stay warm and I knew my other clothes were already wet which just made things colder. I also didn’t care at that point if they got wet since I knew I wasn’t staying. Knowing your limits in any situation is important. Course, many folks don’t test their limits enough as all too often many give up on their dreams and things that require effort. I know of many people who decided to give up on hiking because they were too exhausted and their body hurt too much after a few hours. I sympathize and share the same frailties, but the human body does a masterful job in healing itself, becoming stronger and more efficient when it needs to, and by hurdling obstacles which seemed impossible in the past. I don't hike every day and even with a fairly decent workout regiment my body always hurts the day after a hike. In short, give it time, use your head, and you’ll live a more fulfilling life. I don’t take pride in leaving the trail, but it was the right decision. With each failure I learn and I learned a lot on this trip. If not learning about the sheer strength of the elements, the importance of selecting the right gear for the conditions, or the value of experience from Park Rangers, I learned how to shoot snot out of each nostril at rocket velocity which was a skill I had only marveled in disgust when I had seen others do it in the past. Live and learn. Gossamer Gear...soon to offer TALL pack sizes! This likely doesn't mean a heck of a lot to most of you, but at 6'6" finding gear tall enough for me has been a pain for the majority of my life. I have a lot of luck with mainstream manufacturers (The North Face, Mountain Hardwear, Osprey, etc.) just not UL. After maintaining an on-going dialogue with Grant at Gossamer Gear (http://www.gossamergear.com/) about a couple things, he sent me an e-mail today reading, "after talking with you I've decided to add a tall size to some of our packs. Probably in the Plus first, then Gorilla or Mini." At present, other than those made by Z-Packs, Gossamer Gear is likely the lightest packs on the market. Most of their packs are nothing more than SilNylon ruck sacks (although the unreleased and upcoming Gorilla should be a little heartier) which are actually a very solid option when carrying lightweight loads as an internal frame isn't always needed. My suggestion is to give it a shot and see if it is for you as it would be just one more way to lighten your load. Grant didn't mention a scheduled delivery on these and I definitely don't plan on hounding him being that I'm thankful just to have his willingness on the radar. Although I'm not going to promise it's gospel just yet, it is terribly encouraging for us tall folks and also serves as a very positive reminder that the cottage industry of lightweight backpacking is absolutely wonderful when it comes to considering new ideas and really being flexible to customer requests. Water. Now that’s an important topic in the backcountry. I guess depending on perspective; it may be the most important topic. Water, after all, hydrates your adventure. It aids in processing foods and ridding your body of waste so it can be more efficient. It also keeps you cooler (through sweat) and enhances your circulation to ensure you both feel good and that you stay warmer at night. Water keeps away headaches and muscle fatigue, and let’s face it, without water we’d all be dust in the wind. To any backpacker, water is both terribly important and terribly irritating. Pound for pound, water likely weighs more than anything in your pack. Water is cumbersome and space filling and disappears relatively quickly. Although we could talk about the numerous methods to find clean water from natural sources so you don’t have to carry any, I figured I’d leave this impractical suggestion to the Survival Books and instead focus on what your run-of-the-mill lightweight backpacker should carry. When I was a young backpacker going through Scouts, I carried a couple of canteens. They worked fine and ultimately I didn’t really have a problem with them. Nowadays, canteens have been replaced with bottles of all shapes and sizes, some made of plastic, some of rubber, and some of metal. I’ve even see a couple people with glass bottles which I found quite comical. Unfortunately, the problem with many of these options is that they are heavy and many still aren’t BPA-free. Last I checked, most backpackers don’t enter into a war-zone when hiking. They rarely find themselves crawling on their bellies under barbed wire and are unlikely to need it to repel incoming shrapnel. Much like with many items in the backpacking community, it makes me wonder why so many people feel they need to have a water receptacle that is bulletproof when 99.9% of the time the overkill of packaging is nothing more than dead weight. There are several very popular water receptacles I see in the backcountry. Nalgene bottles (http://www.nalgene-outdoor.com/) are likely one of the most common manufacturers of bottles. They offer bottles of plastic and metal, some of which are flexible. 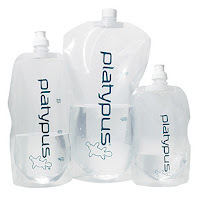 Platypus (http://www.platypushydration.com/) has offerings very similar to Nalgene. 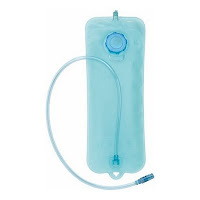 Camelbak (http://www.camelbak.com/index.cfm) offers sizeable rubbery water bladders which can be carried separately or within a back and have a hose that can be used by the hiker without much effort. 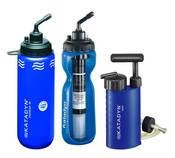 Katadyn (http://www.katadyn.com/) is one of a handful of manufacturers which offer a water bottle with a water filter built right in. Because this is blog is dedicated to lightweight and ultralight backpacking, my focus is on reducing weight while maintaining utility. With that said, I’ve found the lightest water receptacle options to be the flexible bottles from Nalgene and Platypus. I’ve also had great success with off-the-shelf bottles from manufacturers such as Gatorade and Glacier, both of which are extremely durable, lightweight, and last a very long time. Many lightweight backpackers also find a standard 2-liter soda bottle to be a quite inexpensive and durable solution to carrying a decent amount of water. I personally do not like Camelbak or other bladder options principally because they are hard to clean, are a bit clumsy, they are tough to fill, and it is impossible to determine how much is left when they are packed in a bag. I also don’t prefer bottles with built-in filters because they are heavier than I’d like, they hold less water, and the filter is a continuing expense I don’t need. Hard-sized bottles such as those offered by Nalgene have merit, but they are just heavier than I’d like. With that said though, they may be a very good option depending on your environment and equipment. Personally, I’d also take a long look at how easy it is to get water into the bottles. For example, a small mouth bottle may be easier to drink from, but it also may be more difficult to get water from a low volume source. Small mouth bottles may also be difficult to use with certain filters. If you bushwhack extensively, you may need something a little heartier than a thin flexible bottle which runs the risk of being popped by a tree or an accidental drop. I recall an incident in my recent past which I was going through some heavy brush and needed to duck under a fallen tree. As I ducked, my flexible Nalgene popped out, hit a rock, and burst at the seam. Yes I was disappointed and it didn’t make my trip any better, but I learned to either bring a more durable bottle, or as I did, I did a better job of securing my lightweight bottle on my next trip. I also switched to the Platypus brand to give their seam strength a shot after the Nalgene failed from what I felt was not a very rough situation. Water bottles have several uses other than toting water. Many people use the flexible bottles as a pillow while others put hot water in them to keep them warm while sleeping. Some people even use their water receptacles as a camera mount which requires the container to have a stable base and a top which works with the implement that fits the camera. Some manufacturers offer a little LED light which screws onto certain bottles and disburses light fairly well for reading and close-proximity activities. When choosing a bottle, my advice is to go with a standard soda or water bottle and I think you'll be surprised how well they work. You'll also be helping out the environment which is always a good choice. Once you have picked a bottle that works for you, the next step is to get a filter. It is worth mentioning that there is no filter which will save you from every possible waterborne parasite and problem. Short of swallowing a gallon of bleach, you will always have some risk. 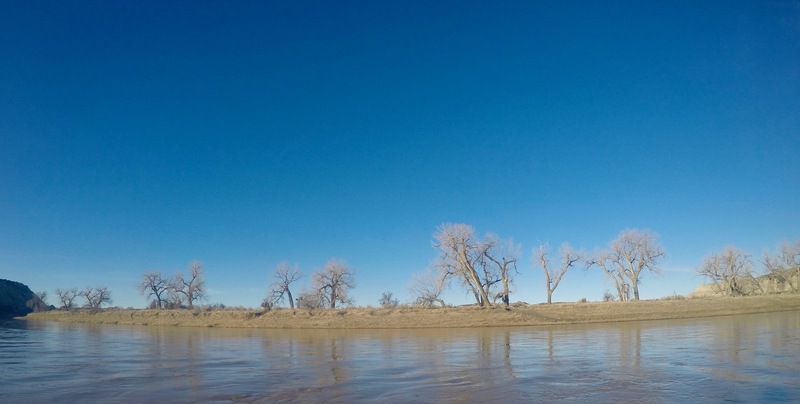 Fortunately, risk can be mitigated by choosing clean water sources, having something to clean out the muck and kill off the main possible concerns. Although there are a ton of filters on the market, I figured I’d mention a few. My personal favorite is the liquid drops offered by AquaMira (http://aquamira.com/). They are faster than most and, at least to me, don’t make the water taste funny. AquaMira also offers a tablet version which is a little more irritating to use in my opinion because they take longer and they don't taste as clean. AquaMira also offers a filter tube which called the “Frontier Pro” which is essentially a straw with a filter and is much smaller and foolproof than pumps. Katadyn (http://www.katadyn.com/) also offers a treatment in a tablet version, water bottles with a built-in filters, and even some unique gravity bags which empty tainted water from one bag to another filtering it along the way. Course, carrying two bags just to be able to use one doesn’t make a heck of a lot of sense to me. Iodine tablets are still popular amongst backpackers and work well on bacteria and viruses, but don't work against protozoa. I also worry about the affect it will have on my personal health. One fairly new innovation is to treat the water with UV light such as the SteriPen Adventurer offered by Hydro-Photon (http://www.hydro-photon.com/). Unfortunately, it only treats one liter of seemingly clean/clear water at a time, requires batteries, has electronics which could potentially fail, and has a bulb which could break or burn out. There are a ton of pump filters on the market, many of which are smaller and faster than others…but all represent the heaviest option and require constant expense and maintenance without providing greater protection than other options. Filters remove pathogents by trapping them in the filter and there is some concern about how frequently the filter needs to be cleaned. Lastly, boiling water is always a solid choice, but it is rarely convenient and would likely burn valuable stove fuel. As I mentioned, my personal choice is the AquaMira drops. Although it requires me to mix two chemicals, I can repackage them into lighter containers and ultimately it is faster and lighter than other options. It also only requires 30 minutes of treatment versus 4 hours as required by other chemical treatments. If I'm overly concerned about the quality of the water, I have been known to bring the AquaMira Frontier Pro in addition to the AquaMira drops. As a lightweight prefilter to get out any particles, I use a very small and inexpensive nylon bag which I purchased at Walmart. The bag is commonly used for wedding knickknacks placed on tables and is one of my secret pieces of lightweight gear. My lightweight option accomplishes the same goal as all the others, it just happens to be lighter. (Please note: Persons who choose to repackage chemical water treatment should measure the “drops” of their new container to ensure the same dosage requirements as identified by the manufacturer are being met). Backpackers should always treat their water as it is simply not worth the risk to roll the dice. Protozoa are 4-15 microns and are often removed by filters...but chemicals have a difficult time breaking them down. Bacteria is actually smaller than protozoa and are therefore harder to stop. Viruses are smaller than both protozoa and bacteria and can contain anything from hepatitis A and B to even polio. Fortunately, it is rare to find these things within waters within the United States. My goal is to look for clean and moving water free of foam, debris, discoloration, and silt (which often clings to bacteria). Obtaining it as close to the source as possible (upstream) ensures less things have the opportunity to taint it. Short of finding dehydrated water (wink-wink), you can’t get away from lugging it around. You can, however, make smart choices to make your water-system lighter. I’ve also found that many people carry entirely too much water. On the Appalachian Trail where I put in a lot of time, water sources are fairly available (although the peak summer months do take away a few options). I’ve found 1-4 liters to be enough for me in most cases, although how much water to carry is a personal decision and should be based on medical concerns and environment. So, what did you do for New Years? Myself, I decided to sleep outside. I had planned on making a short trek to utilize the rare time away from work, but instead a doctor’s appointment for my 9-month pregnant wife ensured I needed to stay home to watch our other young son. Although I would have rather been exploring, this opportunity gave me time to test out some gear in my backyard. The weather was a relatively calm and clear 15 degrees with only a light breeze here and there. Being that my backyard of nearly 6 acres backs up to a small lake, I can assume the air also had more humidity. Generally speaking, before I do anything in sub-20 degree weather my first thought is to check my sanity. I mean seriously, isn’t there something intrinsically inhuman about being outside when the earth literally freezes? Course, as a backpacker who chooses to seek entertainment in these temperatures, I figured I had no choice but to test my gear to ensure it works as the last thing I need is to freeze off my generously over-proportioned fanny due to my own ignorance. To me, backpacking in the winter is great as it usually means I can see further into the tree line and the sounds of the forest are generally quite silent as most bears and their friends are at home watching the NFL playoffs on their plasmas. There are also fewer people, virtually no bugs, snakes are long gone, and a whole new world of beauty is revealed in the crisp air. To most planning on a night outdoors in the cold, they likely would immediately attempt to find the warmest sleeping bag they own. For me, that would be a zero degree custom-made bag from Feathered Friends which includes the specialty waterproof and highly breathable fabric eVENT. Because my wife reads this blog, I’m omitting the price, but suffice to stay this was one of the most stupid and expensive purchases I ever made. The bag is beautiful and terribly warm. Each time I look at it I think how great it looks and admire its crisp lines. It is also very impracticable and totally useless for my needs and lately I’ve been wondering what to do with it other than perhaps frame it. The reason my custom bag doesn’t make a lot of sense is because it is a bag instead of a quilt. Switching from a bag to a quilt and losing the mindset engrained in all backpackers is something I admit was hard to do. After all, I too was raised with sleeping bags, sleeping bags were all that is available in stores, and when it got cold, all I wanted to do was bundle up. As I’ve said before, the insulation on the bottom of a sleeping bag is worthless because once it is compressed it loses its loft (i.e. heat is trapped in the air of whatever fill is being used, and when the loft is gone, so is the heat), and thereby it becomes worthless weight. The quality of the sleeping pad serves as the bottom insulation and even a modest 1/8” – 3/4" closed cell foam pad does the job plenty well. Quilts also drape over the user, much like a blanket does at home, and allows greater mobility and air circulation when necessary. Without the bottom and without a zipper, it then saves you weight and saving weight should be a top priority to any backpacker. It took me to actually trying a quilt to understand that this theory isn’t just an overzealous lightweight backpackers myth – it’s wonderfully load lightening truth! Now keep in mind, this includes my shelter, sleep system and all clothing worn. The clothing is also what I would use for lingering around camp and otherwise staying warm when not sleeping. It makes a lot of sense to integrate clothing carried into your sleep system to increase the effective useful temperature of your system as otherwise why carry dead weight if you aren’t going to utilize it throughout your adventure? Using this method, I could use a very lightweight 35 degree bag and still make it down into the teens without being cold in the slightest. Quite honestly, this system, on this night, where the sky was clear and there was very little wind, I was actually a little too warm most of the time and I could probably have actually gotten by just fine with one pad or without some of my clothing. In the same breath, I have used this system in the thirties on an unprotected 5,000 ft summit and my feet were slightly chilled which had a lot to do with wind, hydration, my socks, and the fact that I only had one pad. My point, each situation is different and little “tweaks” can make all the difference. I should point out that I used a sleeping bag as a quilt because I don’t otherwise own an actual quilt due to their expensive nature. As a big person (6’6” and roughly 270) most quilts are nearly dimensionally the same as this bag anyway as it is a pretty small bag which otherwise wouldn’t fit me if I tried to use it as a bag. I have my eye on a couple quilts by Nunatak USA, but they are a little too costly for me right now and my smaller and just as light Western Mountaineering bag was easy enough to modify (remove zipper and hood, install straps to go around pads, etc.) to serve as a quilt for nearly half the price. I should also mention that I tinker with most of my gear by removing things here and there that I don’t need which also brings down the weight (straps, tags, loops, zippers, hoods, laces, etc.). If I can’t purchase one of the Nunatak quilts, or if Jacks R Better’s offerings don’t float my boat, I’d sure like to find a seamstress who could tinker with my high dollar and quite useless Feathered Friends bag to make it suitable for use as a quilt. By testing this system, I now know it works in these conditions and I have high hopes that it will be a solid option down the road. Testing gear is as important as planning food, distance, and picking equipment.